One of the well known facts in Personal Finance today is that women lag behind when it comes to money management or becoming rich. Even though we have fancier and well more aesthetic avenues to spend our money, most women are not interested in matters of managing or growing it to lead an enriching life. In some ways, this dichotomous behaviour is what drove me to move from Marketing to Personal Finance. This is what also prompted me to write this long heart felt note of why women must invest. Do women need to be talked to differently in order to get them to lead more financially organised or systematic lives? Do they need to be empowered in a different way. 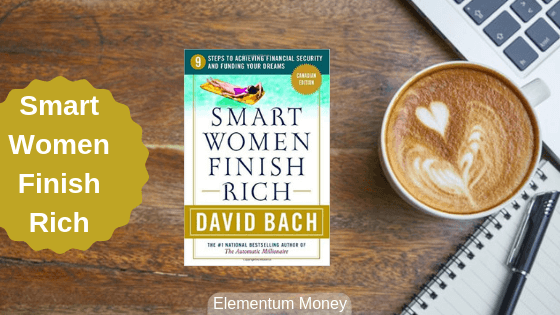 These are the questions which lead me to the book today – Smart Women Finish Rich by David Bach. The first time I heard of David Bach was when I came across the concept of The Latte Factor. Latte Factor is the term he coined to the concept of small unconscious and unnecessary luxuries that we spend on, which could ideally be invested over a long term and yield a far more satisfactory and financially securing result. While there are a lot of ifs and buts to the concept, especially with people taking it literally, I thought it was a valid enough point. While he is best known for his book The Automatic Millionaire, to which the concept The Latte Factor is often attributed, his first published book was the one we are talking about Smart Women Finish Rich, where The Latte Factor probably found its’ genesis. Today, Bach is well known for his nine book Finish Rich series. While everything he wrote made sense, especially the linear sequence which he suggested to get one’s life in order, I suspect the basic concepts would remain the same in all his books. The main premise of the book is something I have now read in a lot of books and am an advocate of myself. Money is an emotional and rational subject. Organise your finances in a way that it aligns with both aspects of money for you. While the book is divided into 9 steps, I thought that 4 of the steps were really more of advice and points to keep in mind. So, let’s look at the five most important steps for Smart Women to Finish Rich. Our relationship with money is complex – we crave for it, we are repelled by it, it helps us buy joy inducing things yet it’s the source of conflict tearing families apart. In India, we are yet to realise the depth of money and most of us barely scrape the surface when it comes to the connection between money and our values around it. One of the most important steps Bach describes in this book is to work on the value ladder. Values and goals are very different. Your value could be to be a provider for the family which could then translate to creating a corpus for your child’s education. Or your value could be presenting your best foot forward in a society where you have struggled hard to come to this level. In that case, spending on outward appearances and grooming might be important. This step is about defining your set of values and defining goals or aligning financial actions on that basis. This to me was a GPS step. For any journey, we must know where we stand and what the desired destination is. In life, even when it comes to our careers most of us know our ambitions and exactly where we stand. In financial matters though, a lot of us are like headless chickens not knowing where we stand and neither do we give much of a thought to where we would want to see ourselves. This step gives an idea for a Financial Inventory which could help you to collect all relevant information and keep it at one place. This step also encourages you to write down your financial goals for utmost clarity and knowing your destination. The goal should be specific which can then be planned for accordingly. The author gives a lot of sensible relevant advice for goal setting and goal achievement in this step. As I said, David Bach is best know for his theory of The Latte Factor. In simple terms, the idea is that we often spend unconsciously on things we don’t really need and could easily do without. Any such small spend also, like a latte, made regularly could build up over time and had it been invested, it could have been a big amount. The point is that everyone makes enough money to get rich over the long term, if they spend in a controlled manner. Then the chapter moves on to the importance of paying yourself first. With any salary or income, ensure you put away a chunk of it into saving and investing for your future. The author recommends a minimum of 12%. In some ways, this point is quite similar to the main premise of the legendary book The Millionaire Next Door which talks about how very unlikely people are millionaires simply through the power of controlled spending and better money management. As the title mentions, the author simply talks about how we should put our savings into 3 baskets – security basket, dream basket and retirement basket. Security basket is a term for emergency savings as well as any insurance you might need to protect from any eventuality. Retirement basket is all about saving and investing money to be able to afford the expenses of our long retirements and any medical expenses that would come along. Dream basket is all the financial goals that you would want your money to fulfil for you. What I really liked about this categorization is that retirement gets a separate basket of its’ own. Very often we look at retirement as a part of a dream basket and often even give it the short end of the stick for goals like children’s education. But, as this categorization shows, it is one of the most important things to which you could be putting away money. While Bach write about this as part of the step about following Grandma’s approach to financial security, I thought this deserved a point of its’ own. So many of us spend enough and more money to avail various services in our lives, be it the gym or the salon for grooming. However, when it comes to managing money, we often thing we can do it ourselves or rely on our male relatives. Check for references among friends you believe have got their money matters in control and avail of professional help. Ask any potential financial advisor the right questions and then keep monitoring. Money management today is a skill that not everyone has. If you need a professional advisor, it is something that you should act upon. This, in a nutshell were my takeaways from David Bach’s book – Smart Women Finish Rich. While the book does mention gender based differences off and on, there was nothing specific oriented towards women probably because money management is not very different for women. Have you read the book? What did you make out of it? Let me know in the comments below.